In a couple of weeks times the TV schedules will become filled with programmes looking back at 2014 (in my opinion you can’t beat Charlie Brooker’s Wipe for how this sort of show should be done), and as my first term as a student at City University draws to a close, I’ve been asked to review my ‘digital output’ from an Information Science perspective. All blogs, are egotistical to a greater or larger degree, but this post is particularly navel gazing, nevertheless I hope to bring some analysis to bear rather than just pat myself on the back. Prior to starting my Information Science course, I must confess I was rather ‘digital wary’. I had never signed up to Facebook or any social media account, barely contributed to any online discussion forums and was one of the few people I knew who did not own a smartphone. My whole attitude to the Internet was to regard it as just a new form of traditional media, in which I was merely a passive receiver of information. Now of course, things have changed and I’ve been dragged into the 21st Century. I feel I have quite a strong presence on Twitter and these blog posts (although they’ve been a requirement of my course), have been enjoyable to write. I am finally beginning to make a ‘digital footprint’. For our final Digital Information Technologies and Architectures (DITA) lab session, we were asked to analyse our Tweets and blog posts. 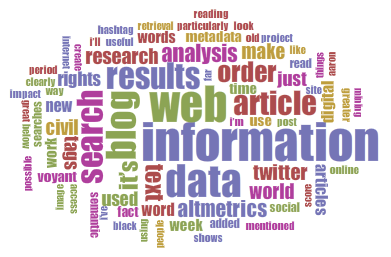 I created a text corpus of all my blog posts and pasted it into Voyant for text analysis, the results of which can be seen in the two images below. As with when I’ve used voyant previously, the exclusion of stop words allows greater clarity of results. I don’t think there are any great surprises revealed here, and the vocabulary is what would be expected of an Information Science student. The stats page of my blog provides a lot of data. Excluding this one, I’ve published 11 posts, of almost 8,000 words, organised under 12 categories, and with 68 tags attached. My readership fell steadily after an initial wave of enthusiasm from my classmates, but the last 3 weeks have seen me consolidate a core of around 30 readers. 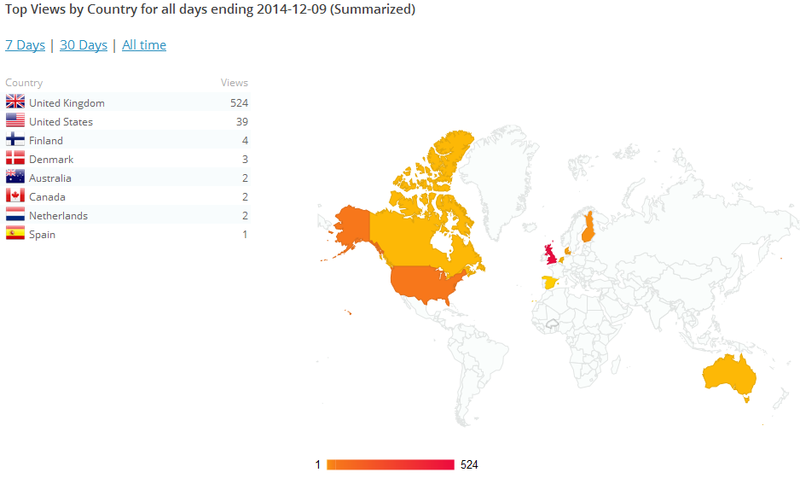 Surprisingly, I’ve also begun to attract a small number of international readers. That’s one of the (obvious) things about the World Wide Web, you may put something online which you may consider very local or parochial, but somewhere, someone else may find it of interest to them too. I then used an Excel template and Twitter Analytics to access a set of metrics for my tweets and activity on Twitter. I repeated the same process as I had done with my blog posts, and exported the text corpus to voyant. As you can see from the first image below, I’ve been very active on Twitter, but nevertheless, I was still surprised to find out just how many words I’d actually written – an even greater number than in my blogs. Obviously, it’s going to vary from person to person, but I’m sure that this situation, (where more words are written in a micro-blogging format than in actual blogs) is most probably the norm rather than an exception. 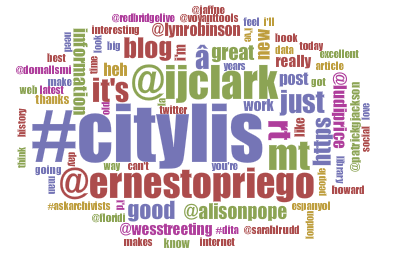 The word cloud produced by voyant also reveals that on Twitter I focus more on social relationships rather than concepts. My most used words are, the hashtag for my course, the usernames of the people that I chat with most often and RT and MT. All of these are signifiers of communication rather than an indicator of what’s being discussed. This highlights for me one of the key differences between blogging an micro-blogging. In a post such as this I can develop my ideas and try my best to explain them to the reader; whereas on Twitter it’s about sharing resources with people and building relationships and networks. Twitter analytics allows users to see metrics for the impact of their tweets. It shows the impression made, which is the number of times the tweet was seen; its level of engagement, which is the number of times someone clicked on it, replied to it, favourited it, or retweeted it; and this produces an engagement rate, which is the number of engagements divided by the number of impressions. Despite this, I’m not going to try to reshape my tweets just to become ‘popular’, because I believe that it’s best just to be natural on social media; however, I can see how an organisation or business could possibly derive great value from understanding how to promote their message more effectively. If anyone would like to get in touch with me on Twitter, I’m @SteveMishkin, you can often find me hanging out at #citylis. Drop by, say hello! I’d just like to end by thanking all of you who’ve ever taken the time to stop by and have a read. I’ll be continuing the blog in the new year, but will probably no longer be posting weekly, more likely monthly, or whenever I feel like there’s something I’d like to share with you. I wish you all seasons greetings, see you in 2015! This entry was posted in Text Analysis and tagged blogging, Excel, twitter, Twitter Analytics, voyant. Bookmark the permalink.